"Globe Arena" redirects here. For the football ground, see Globe Arena (football stadium). Ericsson Globe, originally known as Stockholm Globe Arena and commonly referred to in Swedish simply as Globen (pronounced [ˈɡluːbɛn] ( listen); "the Globe"), is an indoor arena located in Stockholm Globe City, Johanneshov district of Stockholm, Sweden. The Globe is primarily used for ice hockey, and is the former home arena of AIK, Djurgårdens IF, and Hammarby IF. It opened in 1989 and seats 13,850 for ice hockey games, but is also used for musical performances as well as other sports than ice hockey, for example futsal (indoor football). It is owned by FCA fastigheter. The third team to play a home game in their league was Huddinge IK (three home games there, all in 1993), followed by Hammarby IF (20 home games in The Globen to this day) and AC Camelen (one game in 1998, in the sixth level league, with 92 spectators). The first international game played in Globen was between Hammarby IF (Sweden) and Jokerit (Finland) a couple of weeks before the grand opening, although the players were only 12 years old at the time (born 1977) and it was a friendly game. The arena has been the home of the finals of Sveriges Television's yearly music competition Melodifestivalen since 2002. Ericsson Globe has hosted the Eurovision Song Contest 2000 and Eurovision Song Contest 2016. It will host several matches of the 2023 World Men's Handball Championship with Sweden co-hosting alongside Poland. It could host men's ice hockey if Stockholm and Åre are awarded the 2026 Winter Olympics. The arena hosted NHL Challenge series, when teams from the NHL came to Sweden to play against Swedish teams: the Vancouver Canucks in 2000, the Colorado Avalanche in 2001 and the Toronto Maple Leafs in 2003. The first two games of the 2008–09 season of the NHL, between the Ottawa Senators and the Pittsburgh Penguins were played in the Globen, although the rink was altered to NHL specifications. The first two games of the 2009-10 season of the NHL, a home-and-home series between the St. Louis Blues and Detroit Red Wings October 2–3. The first two games of the 2010-11 season of the NHL, a home-and-home series between the San Jose Sharks and Columbus Blue Jackets took place on October 8 and 9, 2010. The game on October 8 was won by San Jose Sharks 3-2. The second game, on October 9, was won 3-2 in overtime by Columbus Blue Jackets. The venue once again played host to two NHL Premiere games for the 2011–12 NHL season as the New York Rangers played the Los Angeles Kings on October 7 and Anaheim Ducks on October 8. The venue most recently hosted the Ottawa Senators and the Colorado Avalanche on 10 and 11 November 2017. Pope John Paul II held a mass in the arena in 1989 as the first pope to hold a mass in Sweden. Other political leaders appearances at the arena have included Dalai Lama and Nelson Mandela. American singer Mariah Carey performed at the arena during her Charmbracelet World Tour on October 5, 2003. American singer Cher performed during her marathon Living Proof: The Farewell Tour on June 15, 2004. Justin Timberlake performed for 15,000 fans in 2007 with the show of his tour FutureSex/LoveShow. Nine years later in the same arena, he was invited to an interval act of Eurovision Song Contest 2016. Canadian Young Money-rapper Drake performed a sold-out show for his Club Paradise Tour in April 2012. Lady Gaga performed here on 30 and 31 August 2012 as part of her Born This Way Ball Tour and on 30 September 2014 in her ArtRave: The Artpop Ball. Jennifer Lopez performed on the 5 November 2012 on her Dance Again World Tour. A small cottage in aluminum with a 12-square-metre (130 sq ft) base was placed upon the Globe on May 26, 2009. The artist's[who?] intention with the arrangement is to illustrate two important symbols for Sweden: the high-technology Globe building and the traditional, simple small countryside cottage in Falu red with house corners painted in white. The house was positioned some distance from the exact top position of the Globe. The artist hopes he will eventually manage to place a similar cottage on the Moon. The cottage remained on the Globe until October 2009. Skyview is an exterior inclined elevator which transports visitors to the top of the arena for a virtually unobstructed view of Stockholm. It has two spherical gondolas, each able to accommodate up to 16 passengers, which travel along parallel tracks on the exterior of the south side of the globe. Skyview opened in February 2010 and carried 160,000 people during its first year of operation. ^ "Metallica återtog publikrekordet i Globen" (in Swedish). svt. ^ "Sweden Solar System: English summary". Sweden Solar System. Retrieved 2009-11-03. ^ "Press release for Ericsson naming rights" (PDF). globearenas.se. Archived from the original (PDF) on 2011-07-22. Retrieved 2009-02-06. ^ Neovius, Lennart (2003-02-22). "EM 1989 – ett historiskt ögonblick". Swedish Volleyball Association. Retrieved 2009-06-06. ^ Petersen, Leif (2009-02-22). "Allt ljus på Globen" (in Swedish). E24.se. Retrieved 2009-06-06. 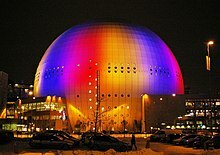 ^ "Ericsson Globe – IIHF.com". International Ice Hockey Federation. Archived from the original on 2011-10-21. Retrieved 2011-05-18. ^ "80-talet" (in Swedish). SVT. Archived from the original on 2011-06-12. Retrieved 2009-06-06. ^ "2000-talet" (in Swedish). SVT. Archived from the original on 2011-06-12. Retrieved 2009-06-06. ^ see Journeyman World Tour. ^ see Foreign Affair: The Farewell Tour. ^ see Wildest Dreams Tour. ^ a b c d e f g "Stockholm Globe Arenas, Company presentation, history & facts" (PDF). Stockholm Globe Arenas. Archived from the original (PDF) on 2010-08-20. Retrieved 2009-06-07. ^ see Tina! : 50th Anniversary Tour. ^ "UFC Sets its Sights on Sweden". UFC. 2012-01-05. Retrieved 2012-01-08. ^ Blizzard Entertainment (2012-07-27). "WCS Europe Finals to Take Place in Sweden's Ericsson Globe – StarCraft II". Eu.battle.net. Retrieved 2013-10-07. ^ "Live | RihannaRihanna". Rihannanow.com. p. 4. Archived from the original on 2013-11-10. Retrieved 2013-10-07. ^ "DreamHack Masters comes to Stockholm – DreamHack partners with Stockholm Live and City of Stockholm". company.dreamhack.com. 2017-11-28. Retrieved 2017-11-28. ^ Anderson, Shelly (2008-10-03). "Rink little short of NHL standards". Pittsburgh Post-Gazette. Retrieved 2008-10-03. ^ Rosen, Dan (2009-02-19). "Stockholm, Helsinki beckon Wings, Blues, Blackhawks, Panthers". NHL.com. Retrieved 2009-02-19. ^ "Röd stuga på Globens topp" (in Swedish). Sveriges Television. 2009-05-26. Archived from the original on 2011-06-12. Retrieved 2009-05-26. Wikimedia Commons has media related to Stockholm Globe Arena. Stockholm Globe Arenas, website. (English). This page was last edited on 9 April 2019, at 10:10 (UTC).